Was that the High or just a Correction in Soybeans? After new recent highs earlier in the week soybeans have pulled back on a wetter forecast for Argentina in mid December. 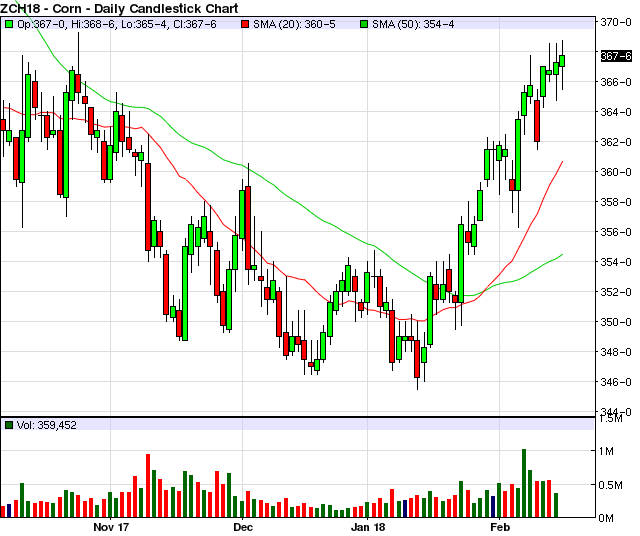 Soybean meal, which had been pulling the soybeans higher has also pulled back from contract highs. So is the party over for soybeans? Or is this just a technical correction before going higher once again? Soybeans had managed an over 80 cent rally off of the August 16th low but have given back more than 20 cents after failing to break out over the mid-October highs. Much of the strength has come from dryness concerns in Argentina and a long term La Nina forecast (which can mean a warm and dry growing season for Argentina). However, to this point Brazil looks good and it is very early in the Argentinean growing season with soybeans just over 50% planted and corn roughly 40% planted. With a little more rain in the forecast for Argentina the soybean rally has lost some steam. Much of the recent strength in soybeans has come from soybean meal. The March soybean meal is also well off the mid-August low but in early November was looking flirting with a breakout to the downside. However a big reversal on November 17th had sparked upside follow through to new contract highs before selling off. With the soybean meal pushing into overbought territory and leaving nearby chart gaps to fill this was a likely area for a profit taking correction. There is also a growing concern over soybean exports. Currently the USDA is projecting a 3.5% increase in soybean exports over last year but as of last week we are running 15.7% behind the pace of last year. Now, it is important to note that weather issues in South America did account for strong soybean sales at this time last year and it is very early in the marketing year. Still, it is concerning that we are falling so far behind the sales pace of last year. 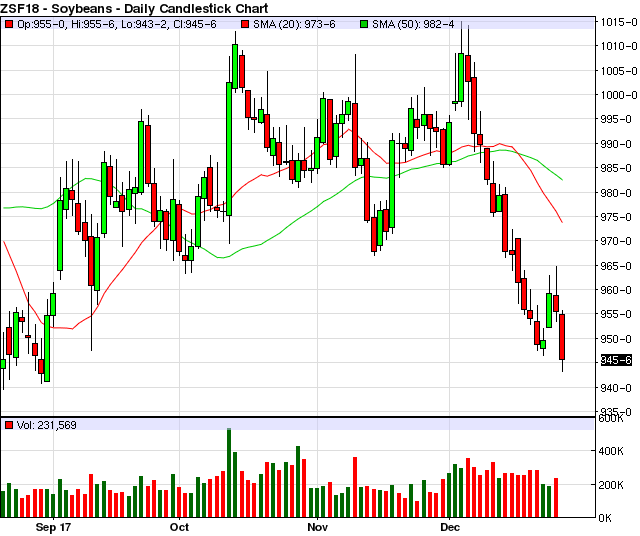 Looking at a January soybean chart there is a distinct possibility that we could be putting in a triple top formation. This may have some of the long speculators nervous and global end users feeling more comfortable. However, with soybean meal being the leader on the last push higher it may make more sense to focus on a soybean meal chart. Which, in my opinion still looks strong. The recent correction off of highs has not done any major chart damage so far and if meal can hold the uptrend line it may go back and at least test highs again. While a little more rain for the Argentina forecast was a bearish trigger to spark a bit of a sell off it may not be a change in the overall weather pattern. It is very early in the growing season and Argentina will need to see consistent follow up rains. So, unless this is the start of a major change in the weather pattern this could just be a correction in soybeans and soybean meal before going higher. 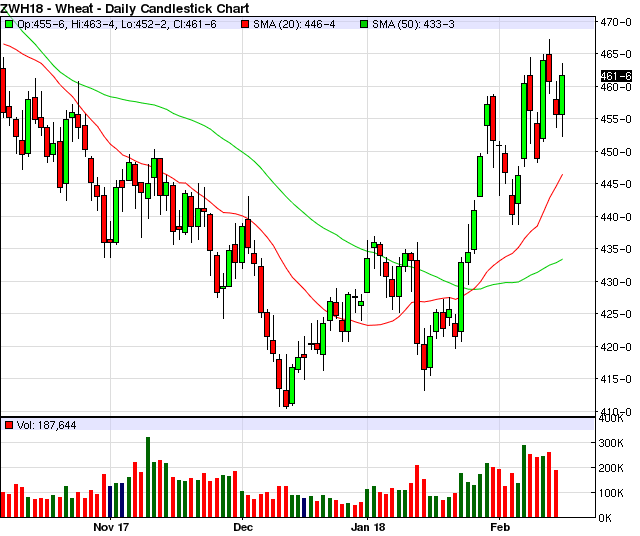 Keep an eye on weather and the soybean meal chart as it may tell the story. Give us a call if you would like more info on the strategies we are using or if you would like to set up an account to put a plan in action. Ted Seifried - (312) 277-0113. Also, feel free to give me a call or shoot me an email if you would like to talk about your marketing plan, the markets, weather, or just to visit. Follow me on twitter @thetedspread if you like.